Cats are true gourmets. For this reason, the soups of Purina Gourmet Crystal are ideal for sugar-coating. The aromas are compelling and the textures are exquisite together in these soup dishes. The broth is rich with chicken, fish, tuna fish, seafood or vegetables, depending on the variety. Food moist Gourmet Crystal Soup is made with the best ingredients from nature and cooked with care to offer a truly unique culinary experience. Your cat will lick until the last drop! That is why he has been chosen product of the year 2017. In the preparation of soups do not add colourings, preservatives or aromas artificial. The megapack contains 32 envelopes of soup. It pampers your cat connoisseur with this wet food of superior quality! Lara Fitness Pouch Lamb and Beef is wet food complete with chunks of Lamb and Beef in sauce. Ideal for cats. Gourmet Crystal is a range of recipes made with a great amount of the ingredients selected from nature, such as pieces of chicken and real recognizable or shellfish, ingredients that you can truly feel at ease. 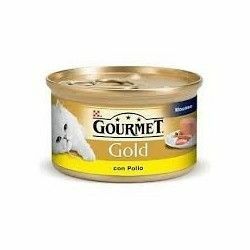 Purina Gourmet Gold is a delicious recipe for demanding cats, in the form of a mousse. 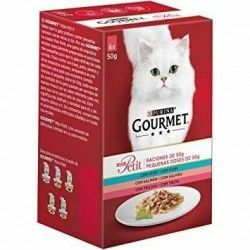 Purina FELIX Sensations is a range of delicious meals made with quality ingredients with a appearance, smell, and of course, taste delicious for your cat. Each meal FELIX Sensations has a variety of small pieces of meat or fish served in a delicious and tasty jell-o to a taste and aroma appetizing. Thin slices of tuna with prawns in jelly that will delight your pet. Thin slices of poultry meat in sauce in small doses of 50 grams just The right amount that our cat needs. Thin slices of COD, SARDINE AND TROUT in sauce in small doses of 50 grams Just the right amount that our cat needs. Thin slices of TUNA, SALMON, AND TROUT in sauce in small doses of 50 grams Just the right amount that our cat needs.